These moist, lemony loaves make a great food gift for friends and family during the holidays or any time of year. 1 of 3 Heat oven to 350 degrees F. Coat two 8 x 4 x 3-inch loaf pans with nonstick cooking spray. Dust with flour; shake out excess. 2 of 3 In a large bowl, using an electric mixer, blend cake mix, pudding mix, sour cream, oil and eggs on low speed until moistened. Scrape down sides of bowl. Increase speed to medium and beat 2 minutes. Add poppy seeds and zest and beat until evenly distributed. Divide batter between loaf pans; smooth tops with a small spatula. 3 of 3 Bake at 350 degrees F for 48 minutes or until toothpick inserted in center comes out clean. Let loaves cool in pans on wire racks 15 minutes. Turn loaves out onto racks; let cool completely. Sift confectioners' sugar onto top. Cut each loaf into 8 slices. 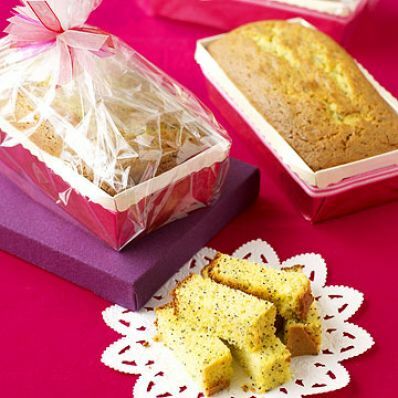 Wrap each slice in brightly colored plastic wrap. Per Serving: 33 g carb., 14 g Fat, total, 50 mg chol., 4 g sat. fat, 256 mg sodium, 0 g fiber, 274 kcal cal., 4 g pro.